Like so many of you, I suspect, my bucket list is getting pretty long. I think I added Charleston, South Carolina, many years ago after listening to a Kempsville High School history teacher talk dramatically about the opening battle of the civil war, which was the bombardment of Fort Sumter in Charleston harbor. The southerners in 1861 had had enough of the tyrant Lincoln, so they started hurling cannon balls at the federal outpost sitting atop an island in the harbor. And so the war was on. Well, being a southerner and a student of history and culture and seeing a good opportunity to travel, I decided last weekend was a good time to explore the city of Charleston with my family. We visited Charleston over the President’s Day holiday weekend. That was last weekend. So the semitropical heat wasn’t an issue for us. February isn’t typically very cold in Charleston, but during our trip we were accompanied by a massive polar vortex that was sweeping through the south, pushing temperatures below norms for this time of year. While we were there, the temperature ranged from the low 30s (in the morning) to about the mid 50s in the afternoon, to as high as 60 during the peak of the day. “Lowcountry.” You read this term in brochures, see it on menus and hear people banter it about while talking about various cultural things, especially food in the Charleston area. Well, the term is very fitting and in a lot more than just a culinary or cultural way. The first thing you notice about Charleston, especially from a hotel balcony, is just how low Charleston and the surrounding area really is. It’s marsh land. My first thought, as I stepped out onto my hotel balcony and began looking out over the Charleston area, was “floods.” My inner geographer couldn’t avoid the obvious. To the naked eye the sea and the land seem to be at the exact same level. Charleston is a city that rests on marsh land, that’s just above sea level — at least for now in geological time — to allow the Holy City to exist. Roughly 40% of the current city sits on landfill that has been used to expand the city’s land mass over its history. As anthropogenic global warming continues at an unchecked rapid pace, it’s likely the God of the sea has already submitted his plans for reclaiming this marsh land. But sinking is for tomorrow, or decades from now, and there are some people with southern accents who’ll deny that Neptune has such nefarious plans for the holy city. They’re well meaning people with good intentions and good hearts, but by all scientific measure are sadly and mathematically wrong. But bless their heart. I’m sure Neptune will consider the wishes of these polite southerners before he sweeps the city out to sea. It would be the only right thing for him to do. It’s the God of Math I’m worried about. I don’t get the impression he really cares about their feelings. Why is Charleston called “the holy city”? Well, if you’re up high enough and you’re looking out across the cityscape you’ll notice a lot of church steeples and spires. The city was established, according to our tour guide, on two principles: business freedom and religious freedom. (After hearing some of Charleston’s history you can see these two principles were approached in this order too. Business is always before pleasure or religion.) The city has a large number of beautiful churches. As we toured the holy city’s old town area it seemed at just about every turn there was another church in view. Besides churches, we were constantly finding graveyards during our walk around the holy city. There seemed to be little graveyards everywhere. And they’re not always part of a churchyard either. Many times while walking down one of the old streets, we’d come across a small graveyard, maybe 5 or 6 tombstones, tucked tightly between two old homes. In old town Charleston, like most old cities, the homes are built very close together. Space is a premium. And because of this, throughout Charleston’s history, fires have ravaged the city. The fire of 1861, which had nothing to do with the War of Northern Aggression, destroyed much of the city. The fire was so intense from being fueled by so many buildings ablaze, that confederate troops 14 miles away could see the flames. And because of these purging fires and restless growth in general, the city has been rebuilt, reorganized and shifted many times. The graveyards were collateral damage in this process. Our guide informed us that Charleston’s history includes many stories of mass graves, I don’t recall all the reasons, probably war and disease, but many of these mass graves now have structures built over top of them. One of the reasons, our ghost tour guide informed us one evening, that Charleston is so haunted. There is a historical debate as to whether Memorial Day may have begun with the discovery of a mass grave in Charleston at the end of the civil war. The confederate army had a prison in Charleston. When the war ended a mass grave of union troops was found. The local population, mostly freed black slaves by then, put together a tribute and parade to honor the sacrifice of these union troops. Downtown Charleston is very charming. Beautiful old hotels, old southern homes, churches, old cobblestone streets in some areas, and a well developed business and restaurant section. The homes have a distinctive look to them. Typically the homes sit with the side of the house abutting the road. There is what most of us would call “a porch” along the lower and upper levels of the house that extends the entire length of the house, and faces the back of the house directly next to them. These side porches are actually called a “piazza” by Charlestonians. An official “porch,” as I was informed, is on the front of the house only. A piazza extends outside along the side of the home. And a veranda is a porch that wraps around the house. Of course if you visit Charleston you must go to the city market on market street. There you’ll find a unique shopping market or bazaar. The market is housed inside a long building stretching up market street. Its filled with vendors, who must set up their entire little store counter and displays every morning before the market opens. I would suggest taking your time shopping at the city market and the stores along market street and then I recommend you have lunch at Tbonz Gill & Grill where you can taste the best Old Fashioned in the city, if not the entire south. After this, you can head for King Street where you’ll find a lot of upscale shopping. And when dinner time arrives, a lot of great dining choices too. As a southern port city the food, at least at the restaurants in the old town area, have a lot of seafood on the menus. And of course being southern just about everything, it seems, is fried. At one place, I’m not joking, they had “fried mac-and-cheese” on the menu. I can report that while there’s a lot of seafood and fried food on the menus there is usually enough variety for the non-seafood eater like my wife and I. We’re basically vegetarians and we had no problem finding something we liked. Which brings me to mine and my wife’s favorite culinary experience in Charleston, and that’s at Magnolias. For a date night my wife and I decided we’d have dinner at the famous Magnolias restaurant on East Bay Street in old town Charleston. The restaurant is polite southern charm and cuisine at its very best. The staff, the food, and environment, and the wine of course, were first class. And if you go you must try the fried green tomatoes as an appetizer. They are served with a spicy sauce on a bed of garlic mash potatoes. Absolute southern deliciousness. As for the people of Charleston, we experienced nothing but friendliness and southern hospitality. The southern accent of some of the natives had a melodious drawl that made me want to keep asking them questions just to hear them speak. I really liked Charleston, it’s a great place to visit for so many reasons. We definitely plan on going back one day. There is so much more to see and do. Truly a beautiful city! I must confess it has been far to long since I have traveled to Charleston and I need to correct that soon. Another city in that area worth visiting is Savannah,GA. Very contemporary and beautiful southern city which still retains its historical charm, much like Charleston. I hope you can make back to Charleston soon, Mike. We hope to go back to Charleston one year in the spring time. We visited Savannah a couple of years ago while on our way to Disney. We liked Savannah and intend on stopping in again next February on our way back down to Disney. Both of these southern cities have a special charm. A fitting tribute to one of the world’s great cities. 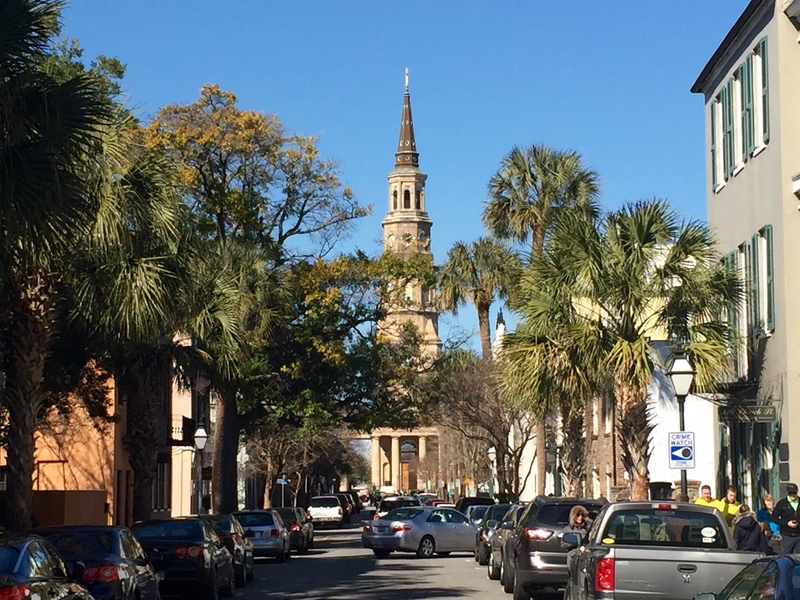 My daughter lived in Charleston after she graduated, and my wife and I fell in love with it. As you point out, it is brimming with history and character. We’re looking forward to visiting it again one day soon. PS – don’t forget serene, out-of-the-way Sunset Park on the other side of the bay. Well worth the drive. Thanks for the comment about my post Mike! I met a few students from the College of Charleston while we were there. It’s a nice city to spend your college years. I will definitely put Sunset Park on the agenda for next visit.